It’s possible that the author of Death of a Salesman might have fathered a child with a gift for the rapid-fire style of screwball comedy. But in her films as writer/director, Arthur Miller’s daughter has remained true to his somber mood. Rebecca Miller seems entirely at home in the heaviness of her 2005 drama The Ballad of Jack and Rose (which starred her husband, Daniel Day-Lewis, no laugh riot himself). And when hilarity breaks out in Miller’s Private Lives of Pippa Lee (2009), it’s like a desperate bark from someone drowning. Miller’s new film, Maggie’s Plan, has the contours—and the far-fetched storyline—of a screwball comedy, and although it misses the happy rhythm of that ditzy film subgenre, it substitutes something intriguing. Theater and cinema are so often at odds when attempting to bring the stage experience to the screen. The stage is intimacy and immediacy, losing oneself in words and performances. The movies are images and stars, losing oneself in the rhythm of editing and camerawork. Big screen adaptations of plays are so often static and stiff when a director remains “true” to the construction of the material, or they “open them up” with action sequences or outdoor scenes (because that’s what movies do) that just as often lose the intensity and focus of the play. That’s not to say the two are incompatible — there are many wonderful film versions of plays — but that the experiences are, for all their obvious similarities (actors, scripts, dialogue, narratives), diametrically opposed in so many ways. Vanya on 42nd Street bridges the two artforms for an experience that is something else altogether, a cinematic engagement with a play performed for the pleasure of the actors and a select audience of friends. This version of Anton Chekhov’s “Uncle Vanya,” from a translation by David Mamet that brings American rhythms and vernacular to Chekhov’s 19th century Russian dialogue, comes out of a production that director and playwright Andre Gregory had been staging as a private rehearsal with a select group of actors. Over the course of years, as their schedules would permit, they would gather to explore the play, the characters, and the relationships for the benefit of no one but themselves. 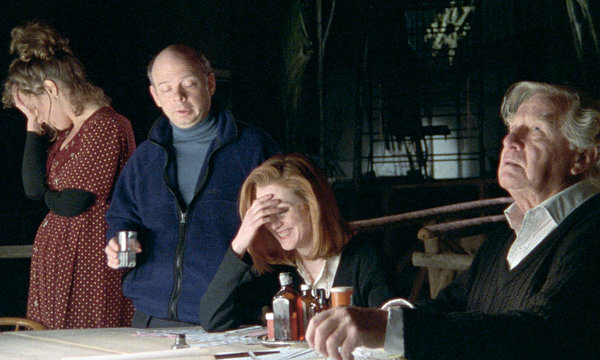 Gregory and Wallace Shawn, who plays Uncle Vanya in this project, invited director Louis Malle, who had collaborated with them on My Dinner With Andre (itself a unique piece of cinema theater), to make a film of it. Not a restaging for the cameras, but an exploration of their entire approach to the play. Vanya on 42nd Streetis neither a screen adaptation of a play nor a film recording of a stage production. What Malle captures in the rehearsal space of an abandoned theater is a record of a creative collaboration that has a life of its own, at once documentary, filmed rehearsal, play within a play, and private production restaged for a camera that becomes almost another member of the ensemble.